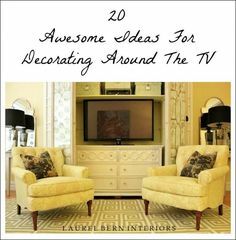 As an interior designer, this blog is a great outlet to release frustration about some of the decorating trends that are foist upon us. We see them in magazines, on pinterest boards, etc. They are new, seductive and surely are immensely cool? Right? In some cases, YES! This new trend might not even be new. But sometimes it’s either in the wrong place, grotesquely overdone or just plain weird. Sometimes, it’s not a big deal, meaning not a costly thing. Like these poofs, for instance. Someone apparently goofed while knitting a cable-knit sweater for their pet elephant and decided to wrap it on the outside of a big ball. And voila. A giant pin cushion. All I can see is digging out peanut butter or cat puke from those little crevasses. No biggie. Into the dumpster it goes. But Some of Today’s Hottest Decorating Trends are going to cost more than 59.95 at Target. I’ll start you in gently. This first one is a bit subtle but I find it irritating. One of the newest and increasingly common decorating trends is drapes hung right from the ceiling, or else right at the juncture of the wall and the ceiling. Yes, on a “hospital track.” Something like this. The idea being that the drapes are hung as high as possible to create as much ceiling height as possible. First of all, unless the drape is meant to be a room divider and the track is in the middle of the room, it looks dumb, IMO. The drapes look like they’re just stuck up there and usually look sloppy and weird. With a rod, the return is usually about 3.5″ (where the drape is turned back to touch the wall) and We can’t do this with a hospital track. Therefore, the look is cheap and unfinished and we can’t have that! If the ceiling is already quite high, then what is the point? The example above isn’t so bad, but another issue is that sometimes the difference between the top of the window and the ceiling is so great that it looks REALLY weird. More about that, in a sec. This is a very cool room done by the darling Vern Yip. Sorry Vern. However, while I LOVE the drapes, that cavernous space between the top of the window and ceiling is really bugging me. What do you guys think? I wish he would’ve dealt with it differently. So, what should it be? There is a lot of logic in this business. I agree that hanging drapes very high up is a good thing, but first, let’s use a rod, okay? Victoria Hagan did it right by splitting the difference. The drapes are still plenty high. If one wants to hang their drapes up very high and the architecture/windows aren’t cooperating, is there a solution? Yes! There are a few things you can do. This requires a highly skilled installer and a good discussion regarding brackets. 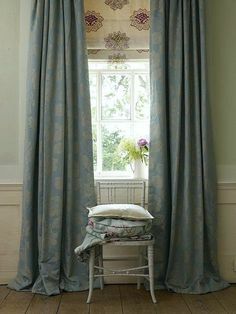 However, the idea is to hang an outside mount Roman Shade to fill in the space above the window and then hang the rod over that. Here, Phoebe Howard used a matchstick shade, but it could also be a fabric Roman Shade. Another idea and it was very difficult to find an image to show you what I mean, but the idea is to create a transom above the window– a faux transom. This can be done simply with picture frame moulding as you see above the door. This is a similar idea, with the moulding above the window built up to be a panel. In this case, there’s a decorative crown, but if planning on using drapes, I would leave that off since it won’t be seen, anyway. It can also be nice to paint the panel a slightly deeper color to give it some additional visual interest. 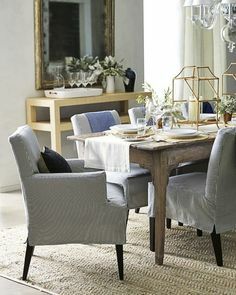 It all depends on the style of the room, the fabrics, etc. Here is what you never should do. The drapes always go above the transom! Please, for the love of God, these truncated drapery rods are NOT drapery rods! It looks like you got the wrong size and now you can’t close the drapes! Even if the drapes are stationary, they should not look stationary. Really a shame too, this is a very lovely living room, but they also goofed in that there should be a third panel on the left and the middle panel should be fudged over to the right a bit to give the entire window/door area balance. Oh and no flood length, drapery please! Drapes should either touch the floor or be a hair’s breath above the floor. A parent actually did this to their child. Someone needs to call Child Protective Services! Remember about 10-15 years ago (it’s okay if you don’t) how charmed we were by Miles Redd’s fabulous eclectic bedroom in Domino Mag? I have to say that I wasn’t a big fan of the rug. I mean, I do get it. The graphic nature made a strong counterpoint to all of the delicate Chinoiserie wallpaper and ruffled silk drapery. It was at that time, when I began seeing Chevron patterns—EVERYWHERE. And the bolder and more obnoxious, the better. Everyone was oohing and aahhing over how horrendous cool they are. The pity is, the Chevron pattern is very beautiful–when done right. I did not write the caption. That came with the photo. Sure. They’re cool unless you have to live here. I don’t get it. It costs a LOT of money to do this. With all of the wonderful options, why this? I would be very happy if someone would explain this to me. Barnum and Bailey living room and what disturbs me the most is how horribly the wall clashes with the sofa. Please be careful with your patterns. And, BTW, that is an excellent use of a hospital track for the shower curtain. Beautiful! Then, one day, I noticed that people starting putting boats in their bathrooms. Ugly porcelain boats, with no place to even put a bar of soap. Seriously? A smaller boat with a fire extinguisher. Sweet. This one actually has some merit, I think. If the person dies while taking a bath, all they’ll have to do is drain the water, dig a hole and they’ll be good to go. This one is a fancier porcelain tub modeled on the coffin below. Hey, I’m just reporting what I see! the pin it button is there, but you may not see it, but if you click on the image, it will take you to your pinterest page. There’s a lot more to come! 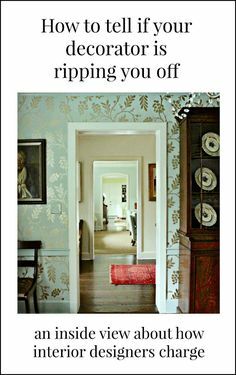 I have a lot more bloopers and decorating trends you probably would be wise to avoid. Or at least think very seriously about before you dive in. Warning! 3 Interior Design Trends You’ll Regret! I’m sorry, but my powers of imagination are far more dim than might appear. :] It’s probably fine because weird windows are very difficult. Glad you’re laughing! Me too. It matters not to me if 99% of the world is doing something and everyone is oohing and awing how awesome it is. And no, it’s not you. Okay, I have to admit that much as I love this post, I really like (although I don’t own one) those poufs. I suffer a lot with leg pain, and it would be much more comfortable to prop my leg up on one of those rather than the hard wooden coffee table. Maybe I’ll get myself one for my birthday. Loved this article. In three rooms I have french doors which are about 18″ lower than the window. I had intended making valances above drapes for the french doors so they are the same height as the Roman or London blinds at the windows. I would appreciate your advice on the best way to hang the valances and drapes – two rods or a rod for the valance and track for the drapes? I don’t make anything, but valances are always mounted on a board and if there are drapes, they are pinch pleats with a traverse rod. I found your blog yesterday and can’t stop reading 🙂 A picture in this post reminded me of a situation I am trying to resolve. Is a traverse rod the same thing as a hospital track? What do you think about reusing a pre-existing traverse rod that formerly hung sheers? There are a lot of older homes that have high quality installations, but are just dated. Like, really dated. No, a traverse rod has a mechanism to open and close the drapes and I don’t believe can be hung from the ceiling. The hospital track is just a single track which is either attached to the ceiling or some are embedded in the ceiling. Of course, the latter would be more expensive to install. There probably are mechanical systems to close the drapes, otherwise, they ned to be manually opened and closed. Rolfing big time! Wooden tub sent me over the edge. And Tory burch’s living room which must be the one she banishes evil relatives to so they leave quickly. Once more you are spot on! Love, love your discernment and wit! thanks for a good laugh this morning. Your kind of irreverent humor is priceless. It has been like a white elephant to critique other designer’s oeuvres. The ones you found though – I don’t know where – are really amazingly bad mistakes, which does not speak for our profession. Thank you and I am looking forward to seeing more. Trends can be so puzzling! Boat tubs & even some framed-in tubs, equal risk to life & limb. The tub in our master bath just lurks around waiting for the opportunity to break a hip. How can vertigo inducing design–Chevron & crazy geometrics–be SO popular? 9′ and 10′ ceilings that need to look even higher? If you’re 5’1″, 9″ is Everest. In contrast to the mantra of ‘hang curtains high!’–Standard curtain length is 84″, which is almost always too short. Do you do standup? If not, you should. Love you whit and on point advice. You are so funny I thought everything you see in magazines is suppose to be beautiful we’ll not the case . That is a very good question! There are a few reasons why this happens, but mostly it’s about greater options for light control. For instance, if the shades are sheer, they can filter the light, but they don’t provide privacy. The drapes get closed at night for privacy. Or it could be the opposite situation. The drapes are more sheer and filter the light during the day and at night a shade comes down for privacy. This might also hold true for certain times of the day or for TV watching. Using two different types of window treatments offers more options. Another guffaw worthy column with your sassy spot-on commentary. I look forward to your emails every week. Love your willingness to call out truly bad design. Often when I’m reading my monthly cache of shelter magazines, I think, “If that designer wasn’t famous this would not be in this magazine, and, if I did that in my home and sent it to one of those “rate my home” sites, I’d get laughed off the internet. Ha! Love this blog so much it hurts!! Not a Vern fan- I remember his beach house in HGTV magazine- he loves him some Chevron with strips and a trellis yep he’s got it all covered in a freshman designer way- very forced visually- there is no soul- I so remember those crazy drapes- I also remember thinking what’s this polished designer (by reputation anyway) doing in this over the top dorky magazine? Ahhhh yes, he works for HGTV – ekkkk it’s like design on Ambien! This is the funniest post I have read in a very long time. I completely agree with all that you have said. OMG – I kept waiting for it and it just came, with the bath tubs! I laughed so much at your comments I had to make a quick getaway to the loo – where BTW, I do not have a boat – just an old fashioned tub with shower over – works for me. In the master I removed the tub and have a nice walk-in tiled shower. Great post – I also admit to no geometrics whatsoever! I’m a plain gal. Thanks for all the great posts you write. Hysterical! And some very good advice. I see so much stuff on the blogs that is so bad, and even in the magazines where the design editors ought to know better. I agree with everything you said, except the part about curtains should always go above the transom. Transoms were created to allow for air circulation in warmer climates. In order for them to do their job, they need to be free of window coverings. With the curtains hung below them, they are free to do the job they were intended to do even when the curtains are closed. If the curtains are hung above them, when the curtains are closed, they can’t allow air to circulate. Oh gosh Loribeth, I’m such a northern girl. Our transoms rarely if ever open! I can’t wait for the next installment of this series, Laurel- you are just so spot on, as always.. and, hilarious! You are responsible for having me start every Sunday morning with a big smile.Thank you! Sometimes I look at rooms in the design magazines and have to wonder if it’s me that’s behind the times- or if I am looking at what’s just a baaaad trend. I am glad that I am not alone. :-)You brought some real design doozies to the table this morning! Those columnar curtains, for example, always irked me- they looked as though they were just plastered to the celling, with a rod connecting them visually- that didn’t look like it served any purpose. I did my curtains high up, and with matchstick blinds beneath as you advised to hide the gap; perfect because they also hide the room darking roller blinds that my husband insists on pulling down on frigid winter nights to conserve heat. I also love the extra molding idea you suggested! Did you notice that the Barnum and Bailey living room even comes with a gigantic spool of rope ,a.ka. side table, in case any animals need corralling? Got to love it..
Can I add that I hate puddled curtains? I agree with all of your assessments. I couldn’t believe some of the tubs I saw when house hunting. I was sure they were selling because someone broke their neck trying to climb out of one of those monsters. I think there is a huge difference between chevron and herringbone. A marble herringbone floor is really classy. Chevron looks busy and weird. I really busted my gut with an unexpected gawfaw when I saw that casket! So true! Plus they must be uncomfortable as all get go. Nothing like a nice soaking tub with a 90 degree angle backrest that makes you sit up straight as a ruler and pull a hamstring at the same time. I am not quite sure how I stumbled onto your blog but I have signed up and now receiving your articles.. I absolutely love your information, but even more so, I love your sense of humor when describing the decorating “dont’s”! I look forward to each article and wanted to thank you for taking the time to teach all of us who care about good style and the bad too… Thank you!! !